We are a game loving family and love adding new games to our collection. 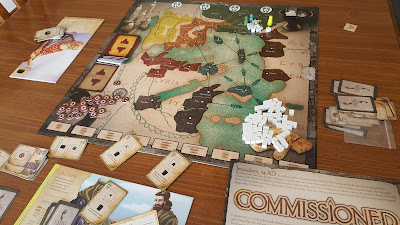 We have been playing Commissioned from Chara Games for several weeks now and are excited to tell you all about it! We would highly recommend it and it would make a wonderful Christmas gift for any game loving family! First of all, this board game is not like any I have ever seen before. 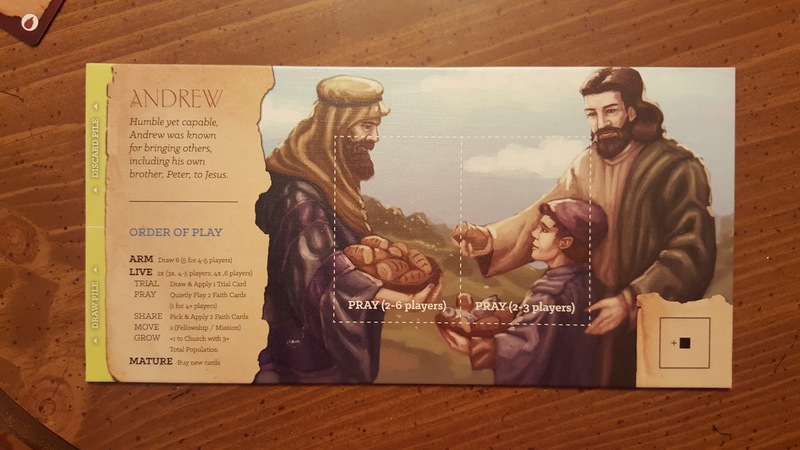 What made it totally unique for us was the fact that the game piece players are apostles, missionaries, and church people and their goal is to spread God's Word all through out the land to grow the church. 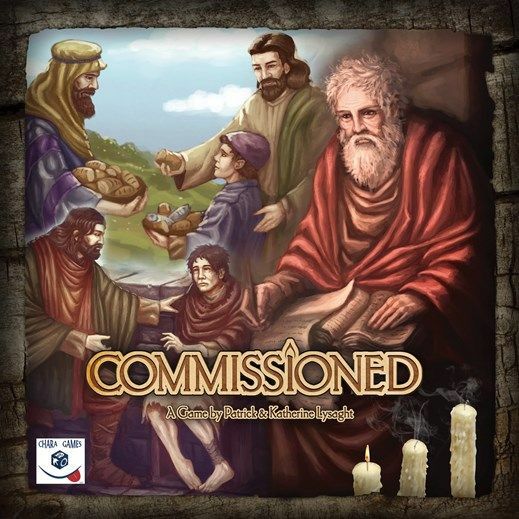 The game takes you through early church history while you are playing the role of the Apostles. However, you do not need to know any church history or theology to play. up. My 13 year old, 15 year old, and myself all played on many occasions. Double sided game board, 5 double sided scenario cards, 6 player boards, 96 faith cards, 27 trial cards, 4 wood missionary meeples, 75 wood church member cubes, 1 Elder's staff, 6 wood player (apostle) pawns, 30 stop tokens, 5 candle snuffer tokens, 1 converted city leader's token, 1 Roman Legion token, 1 die, a rule book, and a themed appendix. Pieces come in a sturdy box that is pretty compact considering what is included inside. 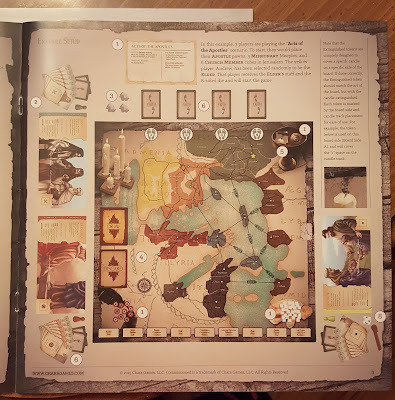 At first glance, the game seemed complicated to me to play but I knew my board game loving son would find it a great challenge and I was not wrong. 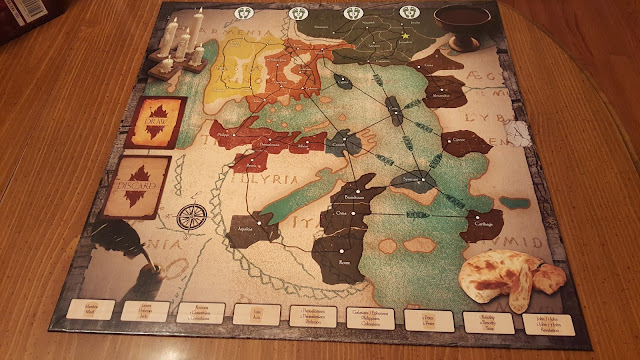 As soon as the game arrived, he headed off with it to the dining room table and began to set it up for play. He was intrigued right from the start. He's also lover of history but again none of that is required to play. 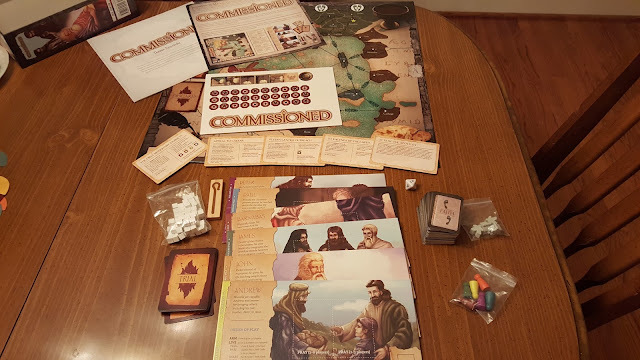 The object of the game is to grow the church through the regions (seen above in various colors) and also to collect the books of the New Testament. Along the way, the Apostles, missionaries and churches face trials and persecution but if you can successfully grow and build new churches in each region and collect all the books before the five candles (top left) are snuffed out you win. We found that to be a lot easier said than done. Fortunately, there are easier levels for beginners and once you get the hang of that, you could move on to a more difficult level as well as 5 different scenarios to choose from too. For instance, in one of the harder levels if the numbers 1-3 are rolled on the die players are not allowed to talk to one another. We really found ourselves thinking about the difficulties and frustrations that the Apostles must have faced as they carried forth the gospel. We played several turns at first without the die and took out the harder trial cards. After playing a few rounds, we began to get the hang of the mission. 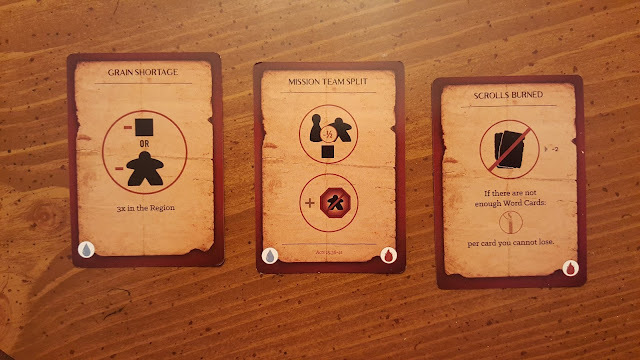 Each player takes a turn being the Elder so the staff is passed to each player after they go through the 3 phrases of play: ARM, LIVE, and MATURE (as seen on the player card below). The LIVE phrase is repeated depending upon the number of players, and the rule book breaks that down for you clearly. Here you can see the examples of the trial cards. Each card is marked by difficulty. The blue water drop cards (Disciple) are easier to deal with than the red fire cards (Martyr) so when we first began we took the easy route which wasn't all that easy! 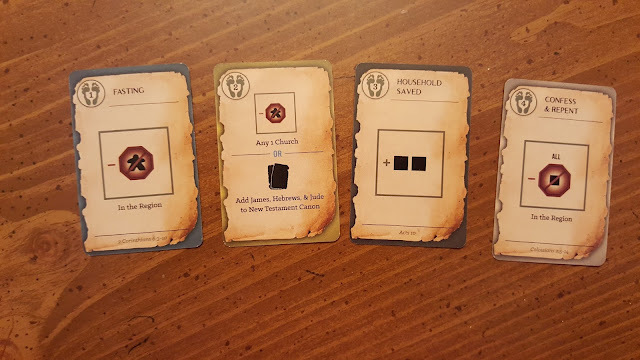 Each player also has faith cards and their actions vary as well depending upon the Apostle chosen and are sorted by faith points in the top left corner. These cards help to counteract some of the trials faced in the Trial Deck. This is just one of those games that it is best to dive right in to and play. 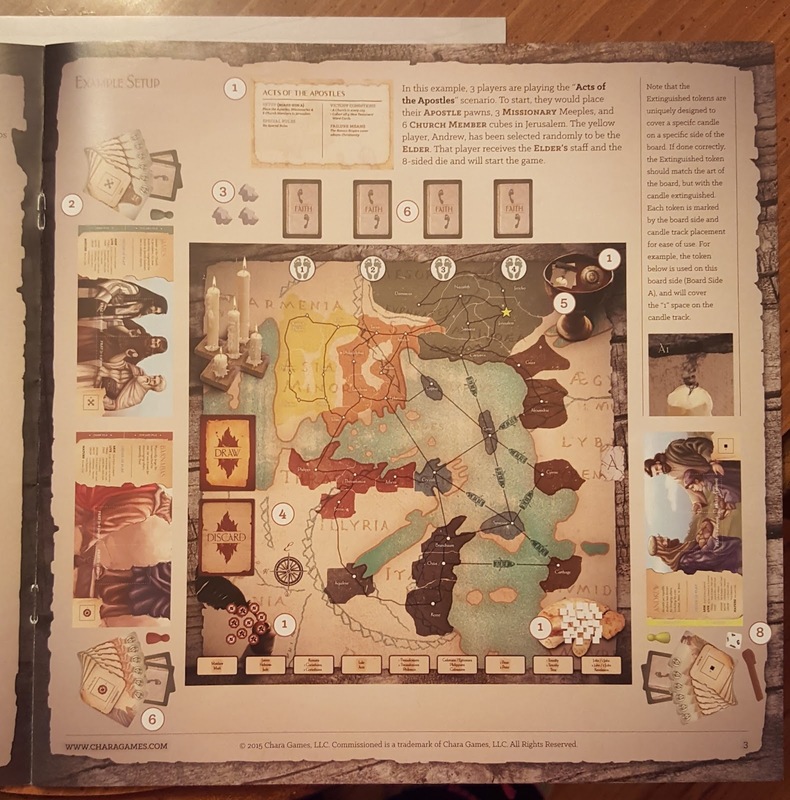 The rule books gives great details and instructions as well as the video on how to play but we found the easiest way to learn was to just play and play! Commissioned became a regular fixture on our dining room table for weeks. We really love challenging ourselves just a little more each time. I especially love that the actions involved to play are named pray, share, move, and grow. What a great reminder to all Christians! So go forth, you have been Commissioned! 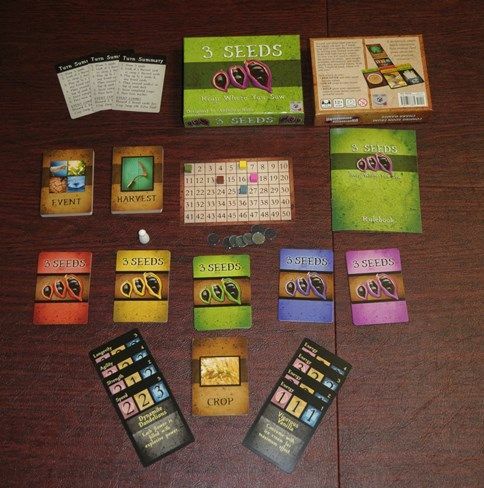 Chara Games has also produced a new card game that has just been released, 3 Seeds. We are looking forward to reviewing that one soon too! Chara Games is a fairly new company whose mission is to bring joy to households through their games. Chara is the Biblical Greek word for unshakeable joy. You can find out more about them by visiting their website, Facebook, and Twitter. The reviews tell all of the things of the chara games as it is really perfectly said those factors related to the whole game plan and plot. look here for the students that is very helpful for the writing services. These chara games are really important which will let you have the best opportunity to enjoy the game at your own time. https://www.mbaassignmenthelp.org/faq-on-how-to-write-mba-assignment/ for the students that is very helpful for the writing services.